The Hepplewhite dining table is a popular item amongst antique aficionados. This simple yet elegant table has been a favorite for over two hundred years and can still be found in antique shops and furniture auctions today. Hepplewhite furniture dates back to about 1780 through 1810. This type of furniture is named after British cabinet maker and designer George Hepplewhite. Hepplewhite was not well-known during his lifetime; however, two years after his death in 1776, his widow published a book of his furniture designs called "The Cabinetmaker and Upholsterer's Guide". Hepplewhite's furniture became very popular in America, where the style is described as neoclassical. Characteristics of Hepplewhite furniture include straight legs on tables that were either tapered or square. Complimenting these straight legs were rectangular spade feet or tapered arrow feet. The shield-back chair is a common design seen in Hepplewhite furniture. The wood used to produce Hepplewhite furniture was usually sourced locally. In Britain, the furniture could be made from mahogany, satinwood, maple, tulipwood, birch or rosewood. American made versions of this furniture were often made of ash or pine. Contrasting veneers were used for the inlay work. Hepplewhite furniture was popular during the Federal Period in America (1790-1828). Geometric shapes and symmetry were part of the style in this era. Furniture was simple, delicate and lightweight for easy portability. Neoclassical elements of furniture during the Federal Period included fluted or reeded tapered legs, as seen on the Hepplewhite drop-leaf, gate-leg dining table that was so popular in America at this time. If you have ever been in a historical home that dates back to the late 1700s and early 1800s you know that average homes were not very spacious during this time. 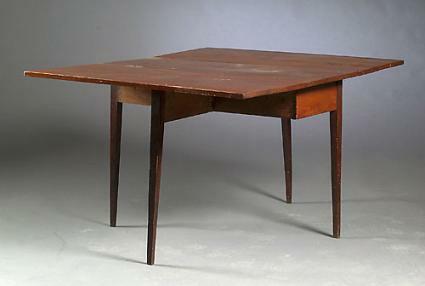 Drop leaf tables were good for saving space when the table was not in use. These tables were made with a fixed center and had hinged tops that fold down when they were not in use. The gate legs were able to swing out to support the top when the leaves were folded outward. These tables were first introduced in Britain. Drop-leaf tables could seat from two to eight people. Most were made from mahogany, stood between 28" and 30" high and had varying widths and lengths. These traditional looking wood tables would fit nicely with any traditional or contemporary style home furnishings. Because of their space saving features they are perfect for smaller homes or apartments. If these auctions don't have the Hepplewhite dining table you want, keep checking back often as the inventory changes frequently. Local antique dealers and estate sales are other sources you can try to find Hepplewhite dining tables. These tables usually sell for $200-$400, depending on the condition of the table. Real antique furniture can be difficult to find. If you really like the style of these drop-leaf tables and are not looking for a genuine antique, you can find plans to build one of these tables yourself. If you continue to pass your custom-built dining table along to future generations in your family, someday the table you build could become an antique. Hepplewhite drop-leaf dining table plans are available to purchase online at Tools for Working Wood. The plan was designed by Carlyle Lynch and includes measured drawings, a detailed parts list with measurements, a list of hardware and notes containing extra information that may be valuable, such as details that describe the construction process of these dining tables. Some furniture styles are timeless, as is the case with Hepplewhite furniture. This simple yet elegant design of Hepplewhite's drop-leaf dining tables are as appealing today as they were in Colonial times. LoveToKnow would like to thank Cowan's Auctions for supplying the image of a Hepplewhite drop-leaf dining table.